Define eutrophication and explain how human behaviors lead to eutrophication. Explain how algae blooms are detrimental to aquatic ecosystems. Explain how zooplankton might impact algae blooms caused by cultural eutrophication. An ecosystem is defined as an association of life and the physical environment. Ecosystems take into account both living organisms and the nonliving components like water, soil, light, etc. Ecosystems can be either terrestrial (dessert, forest, grassland) or aquatic (coral reef, pond, estuary). Within ecosystems scientists study energy transformations. Energy typically enters the ecosystem from the sun, is transferred to photosynthetic organisms (primary producers) and then to organisms that need to eat others for energy, the consumers or heterotrophs. An ecosystem will typically have several levels of consumers. The transfer of energy from organism to organism can be illustrated through trophic levels. A trophic level includes all organisms the same number of transfer steps away from the energy input into an ecosystem. A simple trophic level diagram for a forest ecosystem is illustrated below. 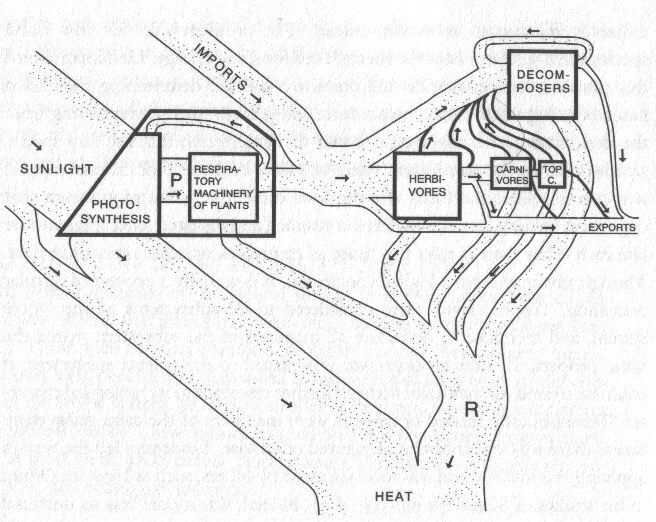 Notice the photosynthetic organisms like plants are on the first trophic level, one step away from the energy source. The squirrel is a primary consumer (eating plants directly) but on the second tropic level two steps away from the primary energy source. At each step along the pathway some energy is lost as heat. 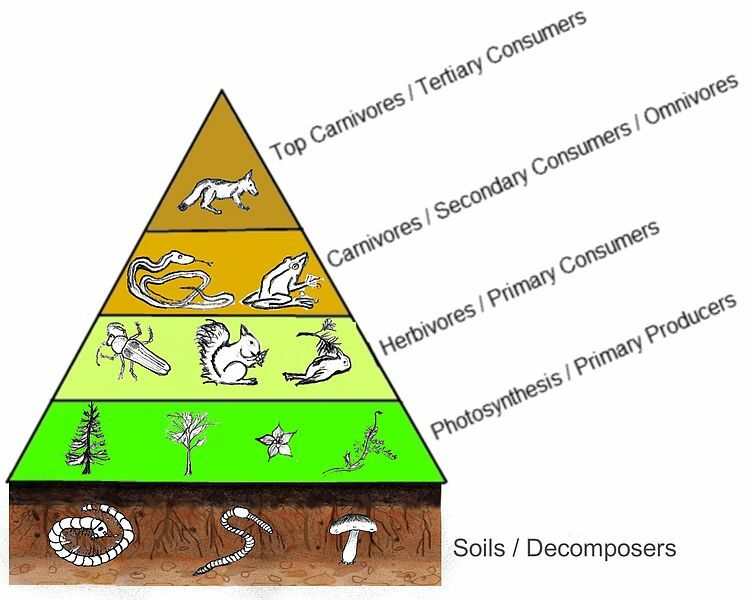 Therefore at higher tropic levels there are fewer organisms (as noted by the pyramid shape) and most ecosystems support no more than four or five total trophic levels. Ecosystems are changing due to human behaviors. Humans negatively impact natural ecosystems through activities such as deforestation, hunting, and pollution. Today’s lab focuses on the impact of eutrophication on aquatic ecosystems. Through eutrophication bodies of water acquire extremely high concentrations of nutrients. The source of these nutrients can be natural or artificial. Humans cause cultural eutrophication through behaviors like run off from agricultural fields, wastewater from sewage treatment plants, and excel detergents running into bodies of water. The excess nutrients fuel photosynthesis causing an increased growth in algae, a photosynthetic primary producer protist, and an algae bloom. During the bloom the algae cover the surface of the water. When the algae die, decomposers in the ecosystem break down the protists using up the oxygen available in the aquatic environment through respiration. As oxygen levels decrease (hypoxia), fish die, and the balance of the ecosystem is destroyed. In an effort to understand ecosystems and human impact on ecosystems scientists often use models. Modeling of ecosystems serves two main functions. First, the model represents scientist’s best understanding of the relationships/functions that define the ecosystem. Second, models allow scientists to investigate questions that would be impossible to pursue in reality. Ecosystem models fall into two categories, analytical models and simulation models. Analytical models use math to explain simple linear relationships. Simulation models, more widely used, are used to illustrate complex non linear relationships in ecosystems. Since the natural ecosystem has numerous interactions between living and non living components ecosystem models must simplify this real world situation. Models incorporate only the most important components or group similar components in an effort to effectively represent the ecosystem in a straightforward fashion. First trophic level: Eelgrass and algae are the main photosynthetic organisms. Second trophic level: Invertebrates, turtles, and fish are the herbivores. Third tropic level: Both fish and invertebrates are carnivores and prey upon the herbivores. Fourth tropic level: The top carnivores consist of gar and bass, which eat the other fish species at lower trophic levels. Decomposers: Bacteria and crayfish are the main decomposers. We will use the model in two different scenarios in today’s lab, to understand eutrophication and to determine the impact of bread on the ecosystem. One potential way to decrease cultural eutrophication is by having higher trophic level organisms consume the algae. We will investigate this possibility using Daphnia, a zooplankton that feeds on green algae, and an alga species called Chorella. Although the information we gain from this activity is useful, it is an over simplification as to what might really occur in the aquatic environment. We will use a colorimeter to measure the algae population. A colorimeter measures absorbance, the amount of light that is absorbed by a solution rather than the amount of light that can pass through. As the algae population increases (number of algae cells), the absorbance will also increase. It is a direct relationship. Obtain two cuvettes and a transfer pipette. Place the blank into the colorimeter and zero it. This provides a baseline measure for the experiment. Save the blank cuvette for later use. Using the disposable pipette, fill the second cuvette with the Chorella algae. Use the pipette to try and disperse the algae evenly throughout the cuvette. Add 10 daphnia to the cuvette and immediately measure the absorbance using the colorimeter. Record your reading in the table below. Remove the cuvette from the colorimeter and allow it to sit, undisturbed for 30 minutes. After 30 minutes, place the blank cuvette (with distilled water) back into the colorimeter. Use the blank to re-zero the machine. Remove the blank cuvette and put the algae/Daphnia cuvette into the colorimeter. Measure the absorbance and record your reading in the table below. How did the absorbance change from time 0 to time 30 minutes? Did the absorbance increase, decrease, or stay the same? What does the absorbance value change tell you about the concentration of the Chorella? Did it increase, decrease, or stay the same? What does the absorbance value chance tell you about the behavior of the Daphnia? Did they consume Chorella? How do you know? In a real aquatic ecosystem, do you think zooplankton could decrease the impact of cultural eutrophication and algae blooms? Explain why or why not. Now that you have observed trophic interactions and cultural eutrophication in a lab experiment, apply that knowledge to the computer model. Use the model to analyze the sensitivity of the Silver Springs ecosystem to cultural eutrophication. Remember that alga is a photosynthetic producer on the first trophic level. The Daphnia would be one of the herbivores in the environment on the second trophic level. Change the levels in the model to simulate a eutrophication situation. View the graphs to see how the different trophic level populations change through the simulation. What is the maximum number of producers the ecosystem can support before higher trophic levels begin to decline? What happens to community respiration in the simulated algae bloom? Does it increase, decrease, or stay the same? What happens to the decomposer population in the simulated algae bloom? Does it increase, decrease, or stay the same? Why? Which group of carnivores (which trophic level) is more greatly impacted by the algae bloom? Why do you think this is the case? Eutrophication is not the only way that human activities affect aquatic ecosystems. Tourism in the Silver Spring area has grown lately as a result of more of vacationers visiting Central Florida. When visiting Silver Spring, tourists enjoy feeding the ducks. But, the ducks are gaining weight and becoming dependent on the tourists as a food source disrupting the normal food chain in the environment. Some environmental organizations have voiced displeasure regarding the dependence of ducks on bread handouts from visitors to the lake. Is it feasible to stop feeding the ducks or have they become too reliant on the tourists and the bread handouts? Use the model to analyze the sensitivity of long-term duck populations to an increase or decrease in bread input. There is a separate variable for bread and the ducks would be on the second trophic level as herbivores. View the graphs to see how the different trophic level populations change through the simulation. Is an elimination of bread feasible? Why or why not? How would the system respond to increasing levels of tourism, assuming bread levels also increased? What trophic levels are most impacted by increased levels of bread? What is the role of bread in the system, and how does its presence or absence impact the ecology of Silver Springs? What would be your suggestion to the managing board of Silver Springs? Should they completely eliminate the tourists feeding the ducks? Why or why not?